Well, most people think of pumpkin pie, and they think “Oh, great, a transport for whipped cream…”. Pumpkin pie is very underrated because no one makes it tasty. They make it with canned pumpkin goo from the store with almost not spices. Well, here is a pie to end all pies. 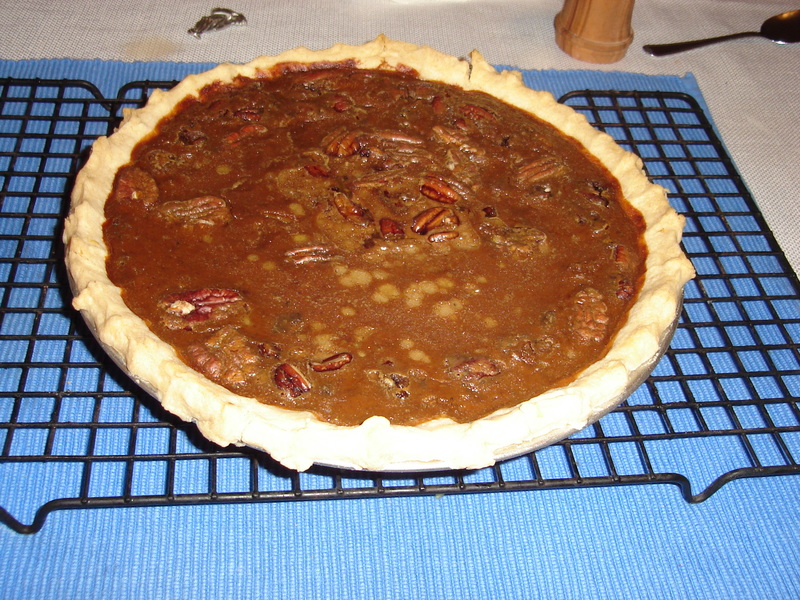 This is my recipe, although it has been influenced by ‘Suzanne’s Old Fashioned Pumpkin Pie‘, especially in the proportion of eggs to pumpkin to milk… however, since the pumpkin pie is really the spices you put in it, I do not feel it inappropriate to claim the following pie as uniquely my own. Remember that all parts of the pie are equally important, a good filling in a crappy crust is a crappy pie… etc. so if you make it, I highly recommend following all the suggestions (like using lard for the crust.) I hope you all make pies and enjoy them. Here is the pie I made today, the first of its kind! First you make a pie crust, use lard. Cut lard into flour and salt with a fork a lot. Then add water, the dough should be neither wet or dry. Kneed the dough 8-10 times but no more. Roll the dough out with plenty of flour flipping it at least once. Fold dough in half, and lay in the 9” pie pan. Pinch the edges up, or cut the crust to the size of the pan and press all around with a fork. Set pie crust aside. Next you have to make the pecans/almond mix. Grind the almonds, and ¼ cup of the pecans. Then take the rest of the pecans and smash them with your fingers to be big chunks. Place all the nuts into a small saucepan with 2-3 tablespoons of butter and sauté then on medium heat for a few minutes. Add 1-2 oz. bourbon, and continue sautéing for a few more minutes. Allow them to cool while you make the pumpkin filling. For the filling, you really need to use a real pumpkin. The canned pumpkin is good for refugees and POWs, but in America, you can afford and find a real pie pumpkin. A small pie pumpkin is about enough pumpkin (roughly 2 cups) any extra you have you can use for something else. Cut the pumpkin in half, scoop out the seeds and stuff, and put in a 13×9 in pan with about 1 inch of water in the bottom, cut side down. Bake at 400 for about 30 min (until soft) and then let cool, peel, and puree with a blender. In a bowl, mix the following really well (the order doesn’t really matter). Bake at 425 for 15 min then turn the oven down to 350 and bake until done, 30- 40 min (I think). A knife inserted about 1.5 inches from center should come out clean. The center is still a little sloppy since it finishes cooking on the countertop! Serve warm, cold, lukewarm, whatever. With whipped cream or not, with coffee or not, this pumpkin pie does not need whipped cream to be tasty, the pie speaks for itself. Enjoy the tasty delicious pie!